We've been having a problem with our Ultimaker 2. The print quality in general seems very good, but the infill is very bad. We've found by setting the flow-rate much higher (as much as 140%) we can mitigate the problem somewhat, but it negatively affects the rest of the print. The images below are of models printed at normal quality (Cura), but infill set at 25%. We are using ABS. I've tried to show the infill from the side to give an idea of how insufficient it is. Note, however, that the rest of the print is not bad at all. Sometimes entire holes will fall in because of the lack of infill, as shown here. We've tried many things already to fix this. I've used the "atomic method" to clean the nozzle; I've opened up the entire print head and cleaned it out (soaked it in acetone over the weekend). We've checked the feeder and Bowden tube. Any advice on what I can investigate, or what could be the problem, would be greatly appreciated! This could be due to your slicing settings in Cura. Switch to the "Advanced" tab and set every speed to 0 except for the travel speed and bottom layer speed. and try a print with 24% infill, it looks less material, but the infill is printed in both directions on each layer. I'll definitely give this a try; the intent of course being to slow down the printer during infill and such. The latest version of Cura gives you the option to copy the settings when you switch over from "quickprint" to "full settings". When I do this, the infill speed for example is set as 80mm/s. The print speed is 50mm/s (for normal quality). This reduction does not seem big enough to make such a huge impact, but it is worth a try. After playing around a bit more over the weekend, I have a funny suspicion that the feeder stepper motor is skipping or something (motor problem, not with filament slipping or similar), or perhaps the nozzle has been damaged. I've already ordered a replacement nozzle. Thanks for the suggestion. We usually left the print settings on the 20% defaults. The reason we switched to 25% is precisely because the algorithm works differently from thereon onwards. Be it as it may, both algorithms used to work flawlessly, and we could set the infill rate based on our requirements for structural strength, not to force a specific algorithm. As in the reply to Nicolinux above, I have a suspicion that the nozzle or the feeder is damaged. I trust that if there was a flaw with Cura it would have been discovered and fixed by now. Perhaps I should also try other slicers (it just always seem like such a schlep to get them working for the Ultimaker), as you suggest the algorithm could make such a huge difference - will keep you updated. Maybe the nozzle is just clogged and not damaged. Try the Atomic Method to clean it. And if you are buying a new nozzle, take a look at the "Olsson Block". 80mm/sec for infill and 50mm/sec for walls is a bad idea. It has only been the default for a year or so and often these new settings end up going back to the old settings after a year or two of complaints. I mean maybe 80/50 works fine on most printers as long as your layer height is thin enough. Most likely your printer can't extrude as fast as it used to be able to due to a very thin layer of gunk in your nozzle. You can burn that gunk out or soak it in acetone over night. Or your white teflon isolator may have softened after lots of printing and now squeezes the filament causing much resistance. Anyway what is your layer height? 80mm/sec is just too fast if you are at the default 210C and .2mm. You can go that fast at .1mm but barely. If you hear the feeder stepper skip back (make that sound) then the pressure is too high. That happens around 10 pounds (5kg) of force which is rather extreme. You shouldn't need that kind of force but that would be completely expected at 80mm/sec .2mm layer height 210C nozzle temp. Thanks for the detailed response. Do you have suggestions for temperature and speeds for ABS? On another note: we are eagerly awaiting the upgrade kit for the Ultimaker 2 (to convert it to a 2+). I agree that the poor infill quality vs. ok wall quality, would indicate that the change in speed between these two, is too extreme. Setting them to 0 means that the standard speed setting will be used. So if you print with 50mm/s then infill would be printed at the same speed (which is not entirely true because acceleration and deceleration change the speed). Hi @thinusp the other thing to realise when you have differing speeds across the layer, is that every time you change the speed you change the pressure in the extruder and this takes a bit of time to stabilise and as a result can deposit artefacts on the surface which is another reason for sticking to one speed normally. Sure if have a large plinth under your model then printing the infill at 30mm/s is boring and can be case for pushing up the infill speed. If that is going to cause problems with the actual model then there are ways of modifying the speeds as you go along the z-axis. No. Sorry. But it's easy to characterize a filament. Print a cube with NO SHELL and 100% diagonal infill. Slice it at 100mm/sec so that 100%=100mm/sec and 300%=300mm/sec. Slice it at your most common layer height e.g. .1mm. Start printing. Adjust temp and speed and look carefully at gaps between each line - if there's a gap you are printing too fast (minor underextrusion). Keep notes. Within an hour you have a nice table of temperature versus speed. Print at half the max speeds. or at least significantly slower. If you do it for every filament - true. But takes me about 30 minutes to get 5 extra accurate speed/temp points for that graph. You can see the gaps between the infill lines if it is underextruding. Or you can hear the feeder skip back. So you just tweak the feedrate by 5% (5mm/sec) at a time until you find the max speed it can handle at a given temp. Then move on. For a 30mm cube I print out maybe the bottom 1/4 and then I'm done. I'm thinking something along the lines of a printer-calibration sheet (those that you scan in again, or pick the number in the software so that the colours are aligned). Imagine asking the printer to print a set of cubes, say 8 by 8, and it automatically adjusts the speed in the one axis and the temperature in the other. Based on the results you can then choose the best combo. Since the temperature and print speeds will have to be adjusted, it would have to be a solution a bit more powerful than Cura. I imagine that it should be possible though... maybe someone smarter than me can come up with the GCODE. If the printer had a camera you could automate this most easily on the bottom layer. Print some lines on the bottom layer at different speeds and see what speed/temp they start to become thinner than nominal. This camera would also be able to auto level of course just by looking at the thickness of the lines in different locations of the bed. Then the bottom layer could be .1mm instead of .3mm (I mean I can do .1mm now but some people can't because their glass is slightly warped). @thinusp - I saw that pattern you show in the first picture today. It happened when I was printing too fast - was printing 200mm/sec (doing a test). The problem was that the nozzle slows down (decelerates) at each change of direction and because it was printing fast there was a lot of pressure in the nozzle and it overextruded on the edges of each trace but then it accelerated and underextruded in the middle. Lowering the speed significantly helped quite a bit. Even if you are only printing at 50mm/sec, try cutting the speed in half (in the tune menu) just to see what happens. I bet you see huge improvement. I think cura by default uses a higher speed for infill - and I don't do that because this is just what you expect - crappy infill. 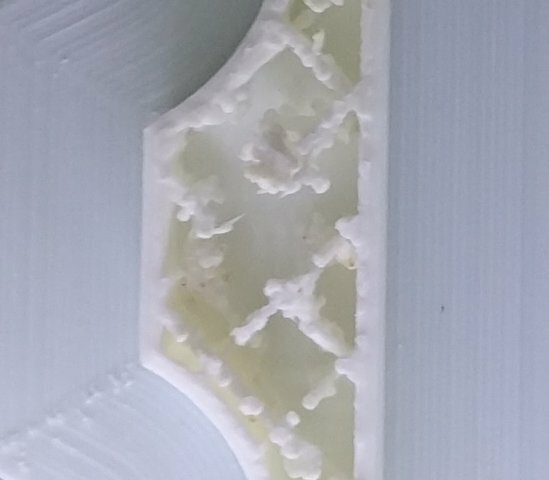 I am personally convinced that there is a bug in Cura's infill processing. I have had several prints that looked very much like the first pictures, at 25% infill. Instead of continuous lines, the infill was more like a series of lumpy posts where the lines would have crossed. However 20% infill worked fine, and so did 30%, with no other changes. I'm pretty sure that's not a feeding problem. 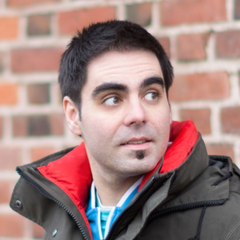 @eldrick: I've had this too. I think it has something to do with the "shells" setting. I am printing parts with three shells (1.2mm) and when the infill meets the inner shell, the printer produces just a drop of filament instead of finishing the infill line and going to the next one. My feeder/heater can do 12cu.mm/sec continuously, so I'm certain that this is not an issue of feeding limitations. Mine can do 18mm^3/sec at 220C with .4mm nozzle (I installed the meduza feeder belt adapter thing - it works but I don't really need it) and I still saw that pattern. It has to do with the fact that it is accelerating and decelerating faster than the pressure can build up and reduce in the nozzle. So you get underextrusion in the center and overextrusion on the corners/edges. For a very large part - say 200mm across then 200mm/sec is maybe reasonable as the feeder can (maybe) catch up but for a 30mm cube it had bad infill just like the photo at the top of this thread. It has more to do with nozzle speed and acceleration and bowden characteristics (storage of pressure) than it does with volume of printing - it happens even on very thin layers where you are only printing 3mm^3/sec. 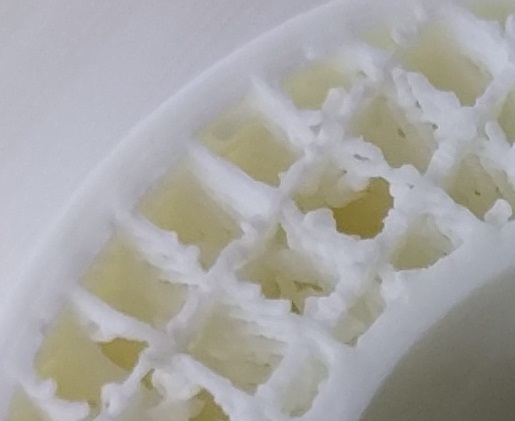 I think it was said earlier but cura has an annoying change suddenly at 25% infill where less infill uses a grid pattern and >25% infill uses an alternating pattern on each layer. The alternating pattern is resting on nothing - well it's resting on the cross lines from the layer below going in the other direction - so you only have 100% infill on the cross points. This is a common problem. Cura by default sets the infill speed higher than the print speed. Make *all* of the printing speeds visible so you can see what is going on. I suspect the infill speed is fast enough that the feeder can't keep up and so is underextruding but outer walls are printing slower.